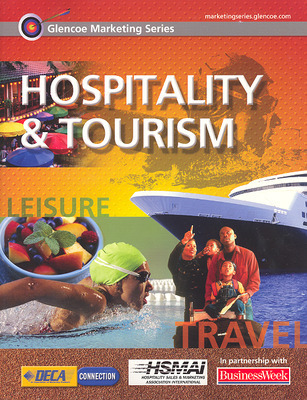 Glencoe Marketing: Hospitality & Tourism focuses on various marketing aspects of the hospitality and tourism industry. Developed to meet state standards and objectives, the Glencoe Marketing Series books have been developed for secondary students taking Marketing II courses. Designed as stand-alone, semester-length texts, books in the Glencoe Marketing Series also function as supplemental texts for Marketing I courses that may use Marketing Essentials. Hospitality and Tourism helps students understand the basic principles behind marketing for the tourism industry. By studying how actual entrepreneurs have succeeded, students learn what techniques work in the real world – and put their own skills to work in a hands-on unit lab designed to mirror a real-world marketing assignment.